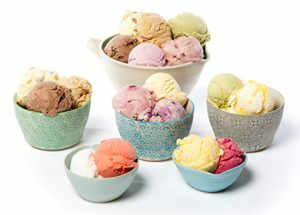 Cornwall has earned a reputation for producing great tasting ice cream and the word ‘Cornish’ is associated with dairy products that are rich and creamy. These days a number of Cornish dairy farmers make ice cream using milk from their own herds. Ice cream, a chilled mixture of cream, milk and eggs, has been made in Britain since the 1700s. 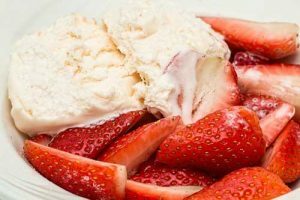 It was a dish enjoyed by the rich who had cave-like ice-houses built in their gardens to allow ice to be stored so they could enjoy their ice cream into the summer. By the end of the nineteenth century new machinery allowed ice cream makers to store their product for longer and to transport it to customers in distant towns, making it available to everyone. Cornwall has a good climate for dairy farming and so ice cream was an obvious product to develop to use up any excess liquid milk. There were also increasing numbers of tourists coming to Cornwall on the railway, eager to enjoy some ice cream to round off their trip to the seaside. By the 1920s ice cream parlours, making and selling a variety of flavours, had sprung up all over the county. Here you could buy ‘a penny lick’, a small portion of ice cream sold in a reusable dish. In those days ice cream was commonly known as ‘hokey-pokey’. This comes from the Italian phrase ‘ecco un poco’, meaning ‘here is a little’. One of those farms producing icecream today is Callestick Farm outside Truro. The Parker family has been farming here for generations and has been making ice cream from the milk produced by their herd of black and white cows since 1989. It is sold throughout Cornwall and across the South of England. Good animal husbandry and land management has always been important at Callestick, as it ensures the production of the best quality milk for the ice cream, while sustaining a healthy diversity of plants and wildlife on the farm, and protecting the landscape. You can learn more about how ice cream is produced at Callestick below.